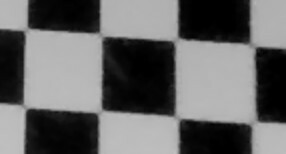 Imatest Checkerboard performs highly automated measurements of sharpness (expressed as Spatial Frequency Response (SFR), also known as Modulation Transfer Function (MTF), Lateral Chromatic Aberration, and optical distortion from images of checkerboard patterns (with a recommended tilt angle of 2-7 degrees for sharpness measurements). 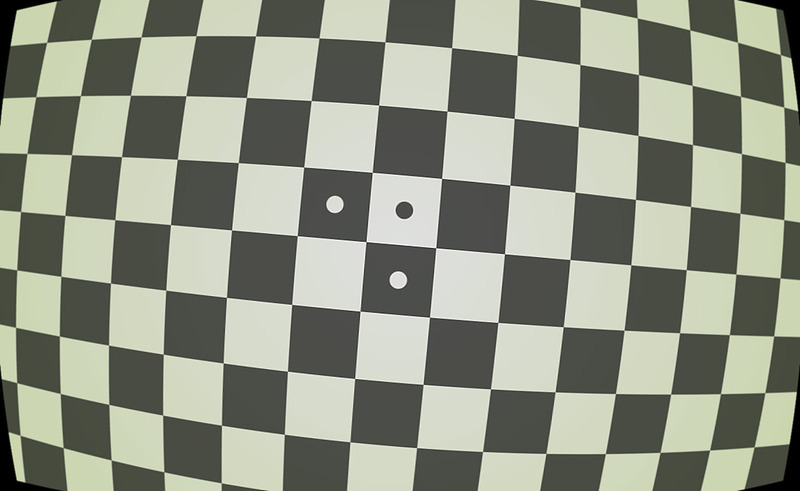 Checkerboard is Imatest’s recommended module for measuring distortion. New in Imatest 5.1: Distortion correction arrows and lines can be displayed. 5.0 (builds after March 2018): Distortion calculations (including decentering) have been greatly improved. 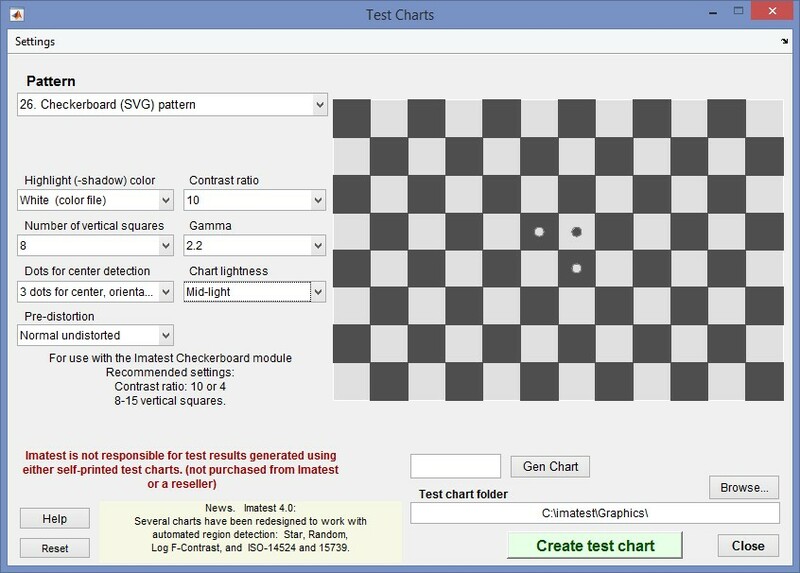 4.5: Checkerboard, for testing checkerboard patterns, is introduced. Compared to Imatest’s other automatically-detected sharpness modules: It is relatively insensitive to framing. You can zoom in or out as much as you like, as long as there are detectable corner features. Compared to the Distortion (legacy) module: It works with highly-distorted (fisheye lens) images. Calculations are more accurate, and it contains all results available in Distortion. Detection must include complete rows and columna of squares, limiting the detected regions. Color and tonal response, available with SFRplus and eSFR ISO, are not available. Some display images with visible pixel patterns can cause the detection algorithm to go into a (near) infinite loop. Details of the regions to be analyzed are based on user-entered criteria (similar to SFRplus, eSFR ISO, or SFRreg, which it closely resembles). 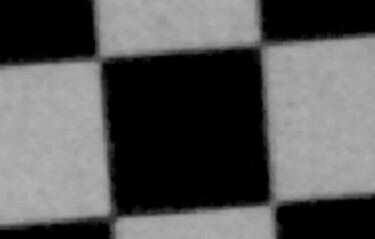 Sharpness is derived from light/dark edges in the checkerboard pattern (which should be tilted), as described in Sharpness: What is it and how is it measured? Checkerboard operates in two modes. Interactive/setup mode (run by pressing Rescharts in the Imatest main window, then selecting 11. Checkerboard, or by run by pressing the Interactive/Postprocessors dropdown menu, then selecting Checkerboard setup), allows you to select settings and interactively examine results in detail. Saved settings are used for Auto Mode. Auto mode (run by pressing the Fixed modules dropdown menu in the Imatest main window, then selecting Checkerboard— a Checkerboard Auto button may be added later), runs automatically with no additional user input. ROIs are located automatically based on settings saved from the interactive/setup mode. This allows images of different sizes and framing to be analyzed with no change of settings. Auto mode works with large batches of files, and is especially useful for automated testing, where framing may vary from image to image. This document introduces Checkerboard and explains how to obtain and photograph the chart. Part 2 shows how to run eSFR ISO interactively inside Rescharts and how to save settings for automated runs. Part 3 and Part 4 illustrates the results for slanted-edge and other measurements, respectively. 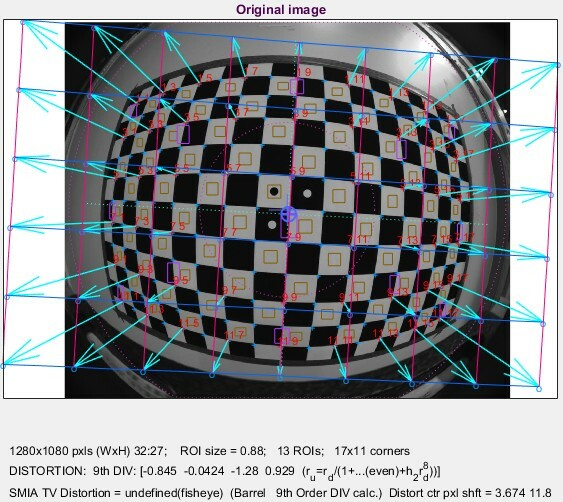 Checkerboard image (simulated): Click on image to download for analysis. Inkjet (reflective) is usually the most practical choice. 4:1 contrast is specified in the new ISO 12233:2014 standard. Matte surfaces are recommended for wide angle lenses or difficult lighting situations. The glossy high precision charts are sharper, but more susceptible to glare (specular reflections), especially with wide angle lenses. Slanted-edge algorithm The algorithms for calculating MTF/SFR were adapted from a Matlab program, sfrmat, written by Peter Burns ( ) to implement the ISO 12233:2000 standard. Imatest SFR, SFRplus, SFRreg, Checkerboard, and eSFR ISO incorporates numerous improvements, including improved edge detection, better handling of lens distortion, a nicer interface, and far more detailed output. The original Matlab code is available on http://losburns.com/imaging/software/SFRedge/index.htm. In comparing sfrmat results with Imatest, note that if no OECF (tonal response curve) file is entered into sfrmat, no tonal response curve is assumed, i.e., gamma = 1 (linear response). Since the default value of gamma in Imatest is 0.5, which is typical of digital cameras, you must set gamma to 1 to obtain good agreement with sfrmat. The relationship between the original and corrected image can be displayed (in Checkerboard-only) when Display arrows & lines is selected in the Display options area of the More settings window. The lines in the original image (below, left) give a good visual indication of how well the calculated coefficients correct the distortion. Distorted image with arrows: uncorrected and corrected. Click on image to view full-sized. The magnification for the corrected image can be adjusted a slider on the lower-left of the Rescharts display area. Checkerboard charts are available from the Imatest store on a variety of reflective and transmissive medium. Although we recommend that you purchase the charts, they can be printed on photographic-quality inkjet printers if you have high quality materials, skill, and a knowledge of color management. Here are the settings. We recommend either 8 or 12 vertical squares. With fewer than 8, the distortion measurement may be less accurate. At least 5 rows of corners (1 less than the number of rows of squares) is required for a 5th order distortion calculation (needed for “mustache” or “wave” distortion). With more than 12, edges may become smaller than optimum for MTF measurements and calculations become slower. There is no practical advantage to more than 12 vertical squares unless you plan to print very large and do a lot of zooming (in and out). The chart center is defined by the corner between the two light circles inside dark squares. When the circles are present the shift of the chart center (from the image center) is reported. Charts can be mounted on sheets of 1/2 inch (12.5 mm) thick foam board with a spray adhesive (such as 3MTM 77 or Photo Mount) or double-sided tape (such as 3MTM #568 Positionable Mounting Adhesive). 1/2 inch foam board stays flatter than standard 1/4 or 3/8 inch foam board. PVC board is also very promising: it may be more durable and it comes in a variety of sizes. 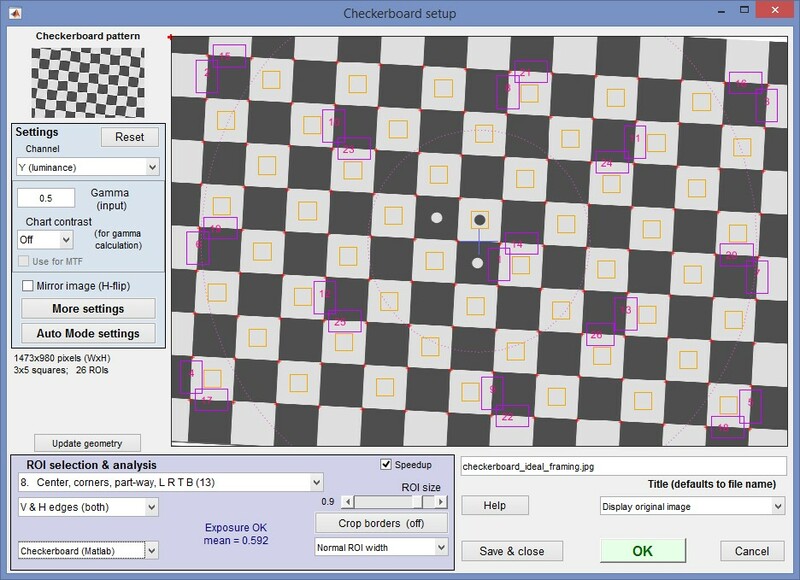 The Checkerboard algorithm searches for clean corners. We have seen cases where corners failed, for example, the patterns shown in the crops on the right. Framing the chart is not critical. Extreme flexibility is one of Checkerboard’s principal attributes. The sides of the chart may extend beyond the image or be well within the image. The software is designed to accommodate a wide variety of framing and aspect ratios. If the sides of the chart are inside the image, you should try to minimize interfering patterns that could be mistaken for checkerboard corners. If possible, chart surroundings inside the image should be neutral gray, but this is not critical. 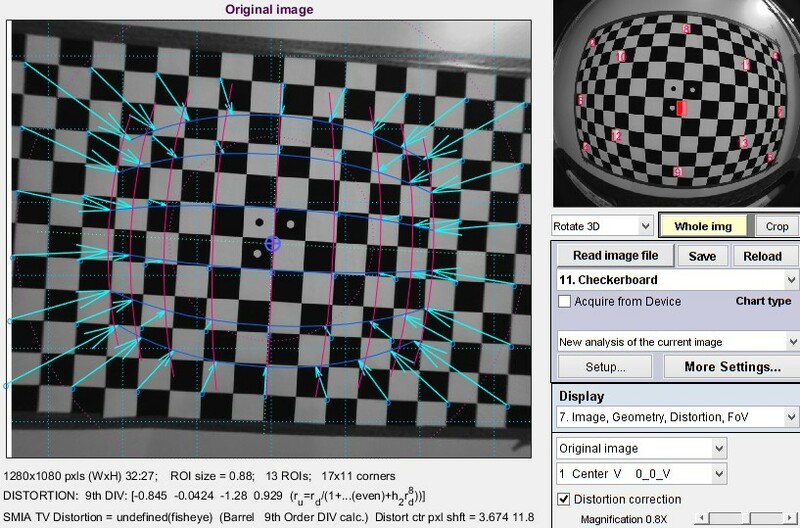 The Checkerboard Setup window image below shows the detected corners for an ideally-framed image. To measure regions near corners, the image should not be tilted too much. The image below is tilted 3 degrees, which is sufficient for slanted-edge measurements (except possibly for tiny images) and allows measurements reasonably close to the corners. It the tilt becomes much larger, measurements near the corners become more difficult. This is especially true for the Checkerboard (Matlab) detection algorithm (selected in the dropdown menu on the lower-left), which only detects complete rows and columns. The alternative detection algorithm (Checkerboard (Custom)) is much slower, but often picks up corners that aren’t in complete rows or columns. If possible, the chart should fill the image. Care should be taken to avoid interfering patterns outside the chart that could be mistaken for checkerboard corners. Avoid glare (shiny specular reflections). This easy for charts with a matte surface. The chart should be tilted around 2 to 7 degrees to avoid pure horizontal or vertical edges. Other orientations may work, but the region of analysis will be reduced. The image can be cropped to remove interfering features near the edges, using the Crop borders button in the Checkerboard setup window. The chart below shows ideal lighting, which may not be achievable for a set of registration mark patterns with fisheye lenses, but it’s good to be aware of. The goal is even, glare-free illumination and to avoid lights shining directly into the camera (which may be an issue with ultrawide fisheye lenses). Lighting angles between 25 and 45 degrees are ideal in most cases. At least two lights (one on each side) is recommended; four or six is better. Avoid lighting behind the camera, which can cause glare. Check for glare and lighting uniformity before you expose. Matte charts are recommended for wide angle lenses; it’s very difficult to control glare with semigloss surfaces. Some recommended lighting configurations can be found in Building a Low-Cost Test Lab. The BK Precision 615 Light meter (Lux meter) is an outstanding low-cost instrument (about $100 USD) for measuring the intensity and uniformity of illumination. It’s the field of view, not the chart-to-camera distance, that counts. 40 inches (90 cm) for a 16 megapixel camera. Details below. For a high-quality photographically-printed chart (such as the charts from Applied Imaging) you can get quite a bit closer. A letter-sized (8.5×11 inch) chart printed on Premium Luster paper on the Epson 2200 (a high quality pigment-based inkjet photo printer) was analyzed for MTF using the 6.3 megapixel Canon EOS-10D. There was no change when the image field was at least 22 inches (56 cm) wide— twice the length of the chart. Performance fell off slowly for smaller fields. Choose a camera-to-target distance that gives at least this image field width. The actual distance depends on the sensor size and the focal length of the lens. The minimum image field is illustrated on the right. Cameras with more pixels, and hence higher potential resolution, should have a larger image field width, hence printed chart width. The camera-to-target distance is not critical as long as it is greater than a reasonable minimum. Image field width (in cm) > 22 × sqrt(megapixels) — or —There should be no more than 140 sensor pixels per inch of target or 55 sensor pixels per centimeter of the target. — or —The distance to the target should be at least 40X the focal length of the lens for 6-10 megapixel digital SLRs. (25X is the absolute minimum for 6 megapixel DSLRs; 40X leaves some margin.) For compact digital cameras, which have much smaller sensors, the distance should be at least 100X the actual focal length: the field of view is about the same as an SLR with comparable pixel count. The recommended distance is described in more detail in Chart quality and distance, below. Good exposure is important for accurate Checkerboard results. Neither the dark nor the light regions of the chart should clip— have substantial areas that reach pixel levels 0 or 255. The best way to ensure proper exposure is to use the histogram in your digital camera. Blacks (the peaks on the left) should be above the minimum and whites (the peak(s) on the right) should be below the maximum. The above image (taken from the Canon File Viewer Utility) is close to a perfect exposure. Some exposure compensation may be helpful. Distance doesn’t matter as long as the target far enough from the camera so sharpness is limited by the camera and lens, not by the target. The target should be evenly lit and free of glare. White balance should be approximately neutral. Use a sturdy tripod and a cable release. For DSLRs, use the mirror lock if possible. You can use Imatest SFR to find the difference made by a good tripod or mirror lock— to sharpen your technique, literally ( pun intended ). Be sure to expose the image so detail is maintained in both light and dark areas. Neither should be blocked (clipped). Use your camera’s histogram. If more than 0.5% of the pixels are at levels 0 or 255, Imatest SFR will assume that clipping has taken place and issue a warning message. This has no effect on the calculations— it’s just a warning that accuracy may be compromised. Be sure the camera is correctly focused on the chart. Place slanted-edge images near the corners of the field as well as near the center. You may find it instructive to photograph the slanted edge target along with a target from Lens testing, but there’s no need to do so. Save the image as a RAW file or maximum quality JPEG. If you are using a RAW converter, convert to JPEG (maximum quality), TIFF (without LZW compression, which is not supported), or PNG. If you are using film, develop and scan it. If the folder contains meaningless camera-generated file names such as IMG_3734.jpg, IMG_3735.jpg, etc., you can change them to meaningful names that include focal length, aperture, etc., with the Rename Files utility, which takes advantage of EXIF data stored in each file. You are now ready to run Imatest Checkerboard. How to Read MTF Curves by H. H. Nasse of Carl Zeiss. Excellent, thorough introduction. 33 pages long; requires patience. Has a lot of detail on the MTF curves similar to the Lens-style MTF curve. Understanding MTF from Luminous Landscape.com has a much shorter introduction. Understanding image sharpness and MTF A multi-part series by the author of Imatest, mostly written prior to Imatest’s founding. Moderately technical. Bob Atkins has an excellent introduction to MTF and SQF. SQF (subjective quality factor) is a measure of perceived print sharpness that incorporates the contrast sensitivity function (CSF) of the human eye. It will be added to Imatest Master in late October 2006. How to Measure MTF and other Properties of Lenses by Optikos.